A story that inspired the writing of Jakob’s Colours. We travel by tuk tuk to The Killing Fields, my two young boys and I. Through the outskirts of Pheng Phong, through the fumes and the noise of heavy traffic; the trundle of cartwheels, the belch and grind of overladen trucks. Uanda drives us. His name means Stone. He is a young man in his early twenties with chiselled features that show an array of fevered emotions as he talks about the past. On the 17th April 1979 Pol Pot took over Cambodia. Within forty eight hours all schools, hospitals and factories were closed. Within three days every city was empty, the educated classes shipped out to collective farms of forced labour. Families were separated. Possessions were destroyed. In less than four years three of the eight million people that populated Cambodia were killed. It is a clear day, the sky milky coloured with wisps of feathery cloud. The sun is still low and casts long shadows across the dry ground. When finally we reach the fields themselves, the thing that is most apparent, after the thunder of the city, is the silence. We begin the walk around them, a voice in our headsets explaining the story of the past. Twenty thousand people were murdered in these fields. They were brought in trucks, blinded and bound, tortured and starved. They were accused of crimes against the state and killed before they could defend themselves. To begin with two or three trucks came every week. By the end they came every day, and before the sun set all of those inside were dead. “Better to kill an innocent by mistake than to spare an enemy by mistake,” Pol Pot would say. They dug their own graves as music played out into the night to drown the sound of people screaming. Bullets were expensive. Tools were used to hack a man to death. Throats were cut with the base of palm tree fronds. Victims knelt in front of pits and did not see the expression on the faces of the men who killed them. The boys and I walk pass these mass graves and would not know them for what they were. But for a shallow indentation, today there is grass covering the soil and meadow flowers of white and pale yellow growing around the fringes. Butterflies flit through the air. Birds sing. Long grasses sway and bob in the breeze. There are bones and fragments beneath our feet. They rise up in the wind and the rain and lie on the surface, splintered and broken. A tooth has been placed on the root of a tree. “Did that belong to someone?” asks Dow, who is eight and understands more than Orly who is still only five and not listening to his headset. He nods, stands staring at this tooth, as we are told of a woman who was killed for stealing two bananas. We walk on, stopping at a large tree, the trunk ancient and wide with years of growing. It is The Killing Tree. It is where children were picked up by their legs and swung against the trunk, their heads smashing against the bark. I look across at Dow to see whether he’s understood what he’s being told, wondering if he’s too young for this information. He reaches out a hand, presses his palm against the trunk, before bringing it to rest against his own head. That’s all he does. For once there are no questions, no lengthy possible scenarios. Just a hand to head movement. “You ok?” I ask him. Behind us, Orly is chasing butterflies back and forth, trying to catch them in his hands. “What’s the biggest transport in the world?” he shouts out. “The Airbus,” Dow tells him. “I think it’s the combine harvester,” he replies. In the tower in the centre of The Killing Fields their is a glass turret. It is full of sculls, sun warmed and glowing. Beneath it lies a mound of ragged torn clothes, the colours dulled and muddied with time. “Will you be there to hold my hand when I die?” Orly asks. “I hope I’ll die before you,” I say. There’s a long silence, only the sound of cicadas ticking in the grasses. “Will I be there to hold yours?” he asks eventually. “I hope so,” I say. And he runs off to chase more butterflies. 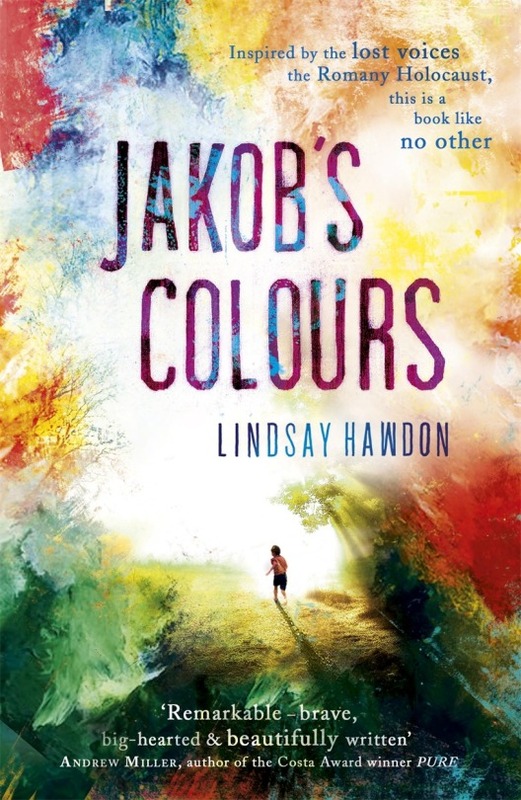 Jakob’s Colours is published in the UK, Australia, New Zealand, Canada and America as well as Turkey, Holland and Czechoslvakia. It has just come out in paperback in the UK on 28th Jan 2016.